After the careless, lame outing by the Super Eagles of Nigeria against South Africa’s Bafana Bafana, the Matchday 24 encounter in the Nigeria Professional Football League (NPFL) gets the attention of football followers in the country. Hopefully, the action packed league encounters will make up for the weekend. The central talking point is the Abia Clasico, which is to hold on unaccustomed terrain, the UJ Esuene Stadium, Calabar. This will be the first time the both teams will trade their rivalry outside Abia State. The stakes are high for the clash between Enyimba FC and Abia Warriors, but the momentum it used to gather by way of fans trooping in to see the game will certainly drop. Consider that Nigerian fans have a poor travelling attitude, coupled with the fact Enyimba have been out of touch with their traditional home, Aba where a huge majority of their ‘die-hard’ fans reside. In Jos, league leaders are back home after playing on the road for two consecutive Matchdays. They host struggling Gombe United and this game might add to Manu Garba’s woes considering the standing of his side on the long. For Gombe to get a positive result in Jos is as hard as winning the league title. FC in the previous game. Also on the radar of hot games to be served is the western derby involving MFM FC and relegation threatened Shooting Stars Sports Club. 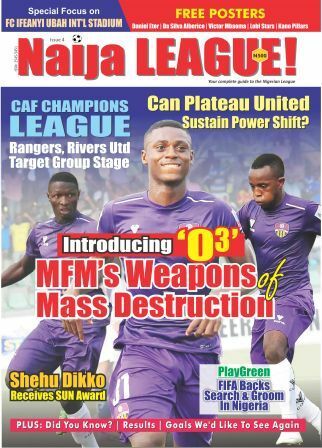 MFM FC’s home record is not flawed so far. Their guests have been having bitter experiences in the league and there is a high probability that the Church Boys will give their visitors more reasons to be concerned in the top flight. The north is not left out of the party. There will be exciting times in Bauchi as Niger Tornadoes pay Wikki Tourists a visit. In katsina, the clash between Katsina United and El-Kanemi is worthy of note. El-Kanemi Warriors lost some surprise point in Maiduguri after their draw with defending champions, Rangers. Meanwhile, Sunshine Stars will travel to the Pyramid City without Austin Eguavoen who threw in the towel this week owing to series of poor performances. Kano Pillars got a draw, on the road, against Shooting Stars. This will serve as some morale booster as they host the Owena Waves. Tony Okpotu, still basking in the euphoria of his second hat trick of the season, will lead Loni Stars to Sagamu as the face bottom placed Remo Stars. The homers are not a “walk-over” side. In their previous game, in Umahia, they shared the spoils with Abia Warriors. Lobi Stars will have a tough date. Rivers United has been the shadow of themselves this term. At the beginning, they had some well-intentioned preparations, including a trip to Spain and an abroad coaching course for gaffer, Stanley Eguma. But all these have yet to materialize and put smiles on the faces of Port Harcourt fans. Quite awful on the road, not too convincing at home, the Port Harcourt based side have not lived up to the full potentials both in the individuals that make up the squad and the support from its financiers. This weekend, they host FC Ifeanyi Ubah who has been on a steady rise to the top. The visitors currently spot the second position and this is due to their good form both home and away. Rivers United needs the maximum point to consolidate their place in the domestic league, while they fight to stay put on the continent where they are still at the group stage. FC Ifeanyi Ubah who have since been ousting from the same competition on the continent have their full concentration on the domestic scene. One thing is sure; Rivers United will face a good squad in Yaw Preko’s lads. They might likely drop points.